In this workshop participants enjoyed the adventure of designing while working, resulting in inspiration for a new work. The focus was on design, allowing participants to design a new work in their own style and telling their own story. 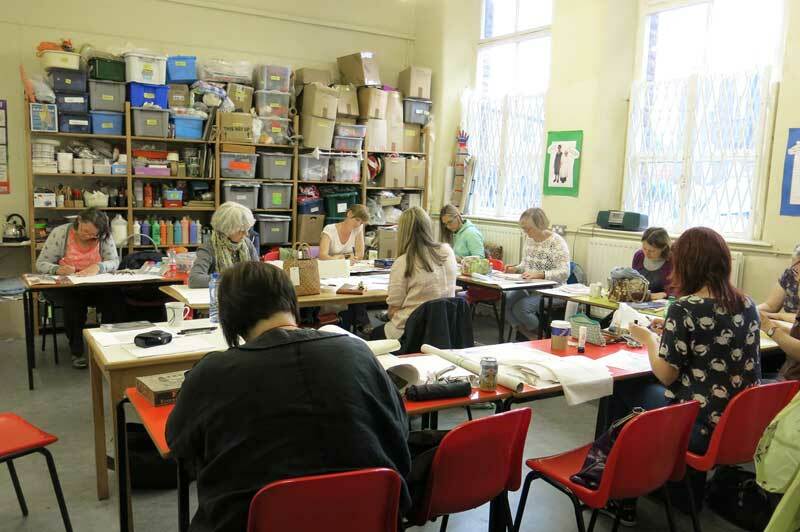 The workshop started with some exercises in mixed media and collage on paper. These fast techniques on paper allowed participants to experiment and to try out new ideas. 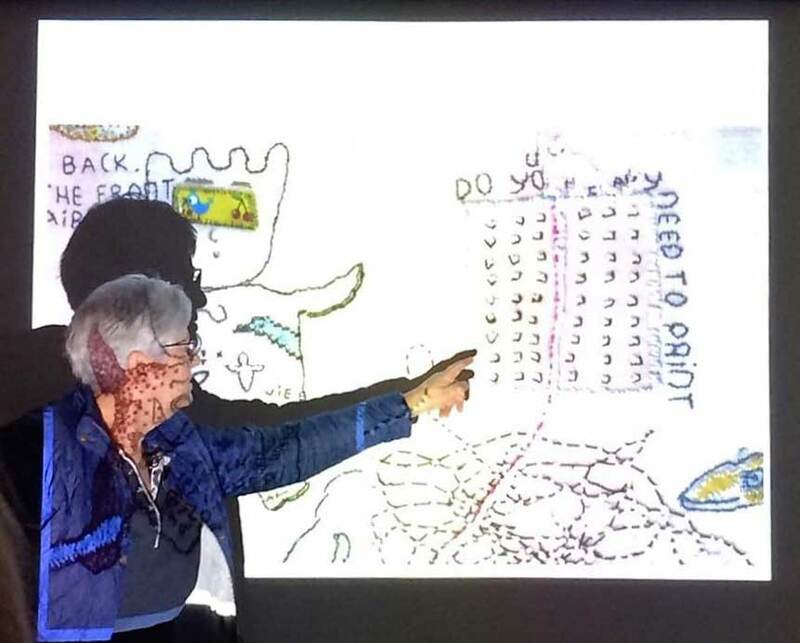 Demonstrations included Tillekes’ favourite embroidery techniques. 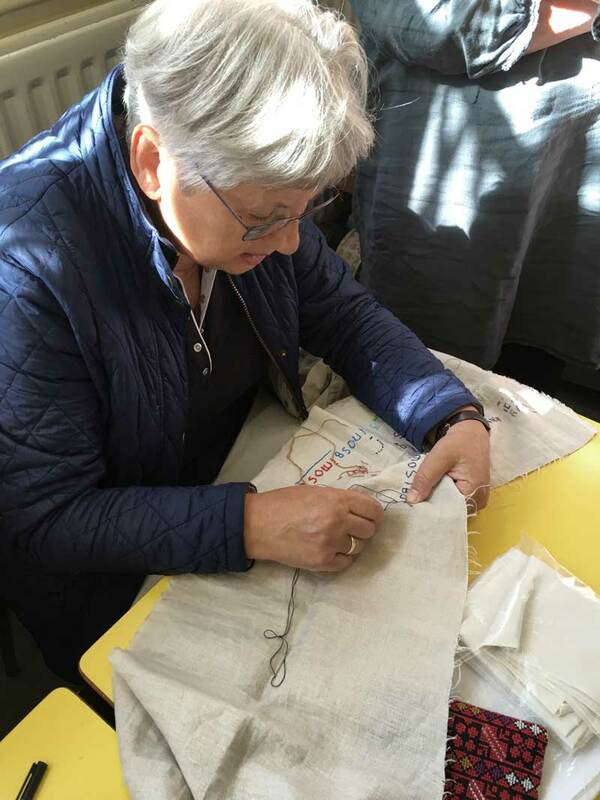 The workshop had an emphasis on hand embroidery, but it was perfectly all right to incorporate any other (textile) technique or use the sewing machine. The workshop was illustrated with small lectures. Special attention was paid to the importance of SPACE in your work, space as part of your composition and space at the start which allows you to add ideas while working. Hand stitching is fun but very time consuming, so participants were told not expect to finish a new work in these two days. Tilleke Schwarz has been an exhibiting member of the 62 Group of Textile Artists since 2005. Born in the Netherlands (1946) as the daughter of a Jewish cattle dealer. Tilleke’s background is characterized by a blend of assimilation and interest in Jewish culture and tradition. The Second World War still has a remote influence. Her love of textiles was passed on by her mother, whose family ran a clothing firm. Her mother taught her the basics of embroidery. She was an inspiring role model, covering numerous table cloths and pillow cases with stitched flower patterns, even at an old age. 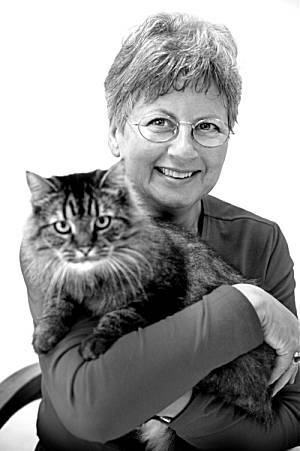 Tilleke has lived for more than 30 years in a small town near Delft with her husband and a cat. She has a small studio at home and a large studio nearby (suitable for drawing, painting and storage). Tilleke attended two art colleges in the Netherlands, focusing mainly on painting and drawing. In-expensive felt markers (in a 5 to 8 colours). A few sheets of tracing paper (A4). A camera, (if you have one) – can be very useful (for instance to make pictures of your working process). A small (at least 20 x 30 cm.) piece of fabric for practicing stitches. Tilleke prefers even weave cotton or linen. Choose a piece of fabric in white or light colour (darker shades are more difficult to use). NB. Even weave is material where the number of warp threads are the same as the number of weft threads pro centimetre. A larger piece of fabric (at least 50 x 70 cm.) which you can use to start your new work. This cloth should be suitable for embroidery, so linen or cotton and also even weave, in case you fancy to incorporate a few cross stitches. Images: You are welcome to bring images of your (recent) work, as Tilleke loves to see what you make and it helps her to respond to your work. It may be fun to share some images with the other students. Do keep in mind that images should be easy to handle and that you only bring very few images (max. 3!) as there is absolutely no time for a large presentation of your work. An embroidery or sewing machine (if you prefer that instead or to be combined with hand stitching) and some threads for machine embroidery – Please note; Any Machine bought into the Silk Museum will need to be PAT tested before the workshop. All very clear. Tilleke is very friendly and approachable and enjoyable to work with. Tutor was lovely – gave an insight into her humor and ‘feel’ of how she worked what was important to Tilleke. The demonstrations helped to clear my mind allowing me to just do it.